One-Punch Man Vol. 5 Review – AiPT! Bullies, underdogs and characters who get no credit: One-Punch Man is a manga that features plenty of those characters and the tropes/themes that go with them as well as a clever twist on the norm as the titular character isn’t the most popular in a world where heroes are ranked and given money based on their superhero popularity level. So far this series has been over the top and fun — but how is the latest volume out this week? Is it good? The overall theme of this series is fun because the hero has no expectations for himself yet he continues to impress everyone. Because he’s not bragging about his abilities like most heroes the public have shifted their mindset on him and have started to think he’s false. That doesn’t bother him either. Like a kung fu master he’s going about his business while his efforts speak for themselves. That’s a hero you can get behind. Love that energy!Fine, you have my attention. What’s good about it? This volume continues from the last with Genos wanting to be a prolific superhero for genuine good guy reasons while his master Saitama AKA One-Punch Man sits by the wayside uninterested in fame or attention. 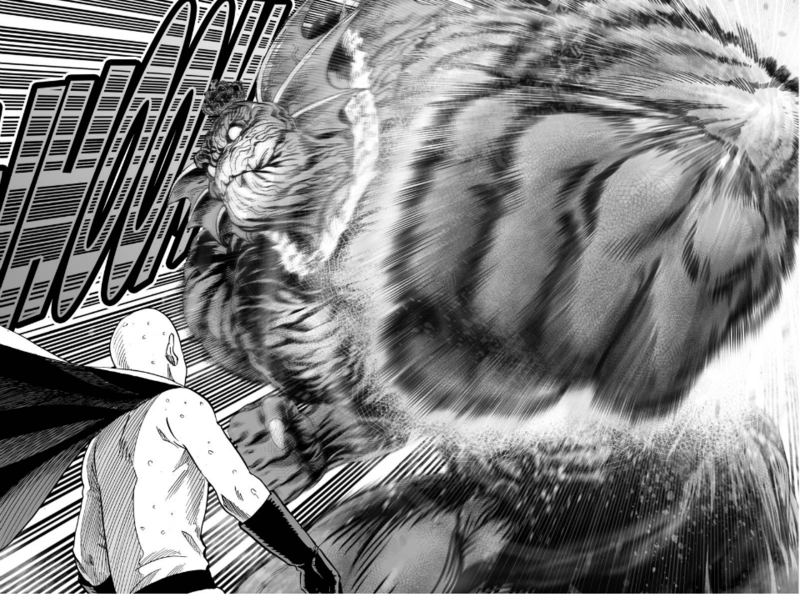 Of course, Saitama can’t sit out for long as a deep sea threat arrives and begins destroying cities; the battling is high energy and very well choreographed by artist Yusuke Murata. One full page spread has the hero taking hundreds of blows which create pockets where the punches land. It’s kind of weird and gross to look at, but creates a vivid image of impossibly fast punches landing at once. Later Genos enters the fray and there’s some fantastic battle damage the character takes that shows off Murata’s ability to draw technology; Genos is a robot after all and Murata goes far enough with the damage to make you feel worried for him. It’s also a good reminder the character isn’t human. That sets up Saitama’s entry into the battle nicely; he’s somewhat dumbstruck by Geno’s damage which heightens the threat level quite a bit but his commensurate lack of worry and damn near apathy when finally throwing down creates a sense of impossible power for him as well, as we’ve come to expect; it all goes a long way in proving why the public would think One-Punch Man is a false hero. Fighting bad guys is just too easy for him! Ouch!The rest of the volume shows us One-Punch Man dealing with the politics of being a superhero as he levels up from the actions of the first half of this volume. These scenes help show how unimportant all the superhero politics are to him and how this attitude might pay off later when One-Punch Man is assuredly bumped up to the top of the hero food chain. One of the best elements of this volume is the last chunk of the book as it follows One-Punch Man in a single day. All he wants is a soda from a vending machine, but doesn’t have the change to buy one. He’s still a lower level hero so he can’t really afford it. Meanwhile bad guys attack and he takes them out. He could care less about them, but they’re getting in the way of the soda! It’s a hilarious way of showing his inability to care or focus on things that aren’t right in front of him. The somewhat homophobic aspect of the Puri-Puri Prisoner character from last volume carries over into the opening pages of this issue. It’s a bit overt in its judgmental look at homosexuals (it uses the word pervert for instance) and shows the creators aren’t quite up on being progressive. It doesn’t run on for too long though with the character only being offensive once or twice before the character is KO’d. As action packed as any manga you’ll find on the shelves this week and well worth checking out. There’s tons of fighting, but it also has a strong message about not bragging about your abilities.